PROMT Professional is a business solution withthe most flexible capabilities for managing the quality oftranslation. With PROMT Professional 9.0 you can quickly obtainhigh-quality translations of documents, Web sites, or emails. Youcan also create corporate databases of translations of similardocuments (for example, contracts or manuals) using the TranslationMemory technology. Translation function can be built into the most popularapplications. Translate using PROMT Translator or use built-in translationfeatures and translate directly in Adobe Reader or Adobe AcrobatPro. Find and correct typos quickly and reliably. Before developing our new user interface, we used the results of alarge-scale usability study of PROMT products conducted by Usethicsin 2008. Create your corporate database of translated texts and save timefor subsequent translation of similar documents. The system willautomatically translate common sections and terminology(specifications, contract preamble, etc.) by retrieving theirtranslation from Translation Memory databases, according to yourcorporate standards. PROMT Translator linguistic editor is the heart of the applicationand allows it to translate texts of any complexity. You can evenget a translation without customizing the system: simply add sometext to the translation pane and click Translate. The goal of suchbasic translation is to help you get the gist of the source textand decide whether you need to work further with it. Because of thenew algorithms and vastly expanded dictionaries (we have added over300,000 new entries), PROMT v9.0 offers high-quality translationeven in this basic mode. For more difficult tasks, such astranslating specialized texts, the system offers an extremelyflexible setup. You have complete control over all translationsettings: choose profiles, enable dictionaries—built-in oradditional dictionaries from the installed PROMT collections, andTranslation Memory databases. Setting up PROMT Professional 9.0 isvery easy and does not take much time. 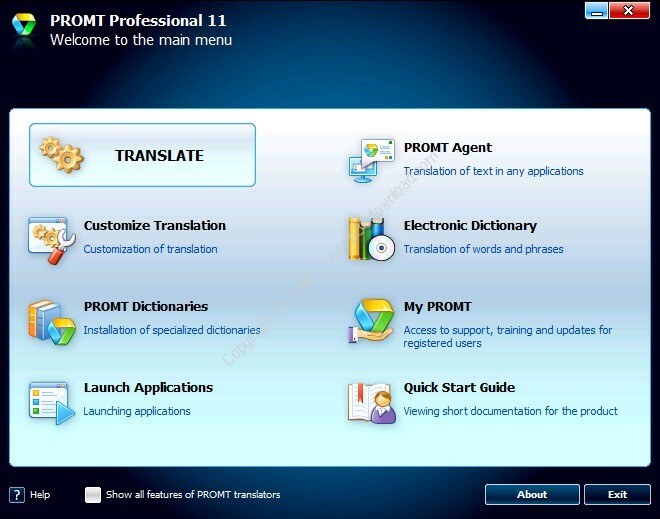 PROMT Professional 9.0 supports translation in the popular officesuites, such as Microsoft Office 2000–2010 (Word, Excel, Outlook,and PowerPoint) and Adobe Reader and Adobe Acrobat Pro. Afterinstalling PROMT Professional 9.0, the PROMT Translator tool willbe added to the toolbar in these applications. Instant messengers have proven their efficiency in a business whena quick communications are imperative, when talking with yourinternational partners, coworkers, and clients, for example. Itwould be daunting and frustrating, however, to discuss the detailsof a project with your partner overseas if you had to look up everyother word. 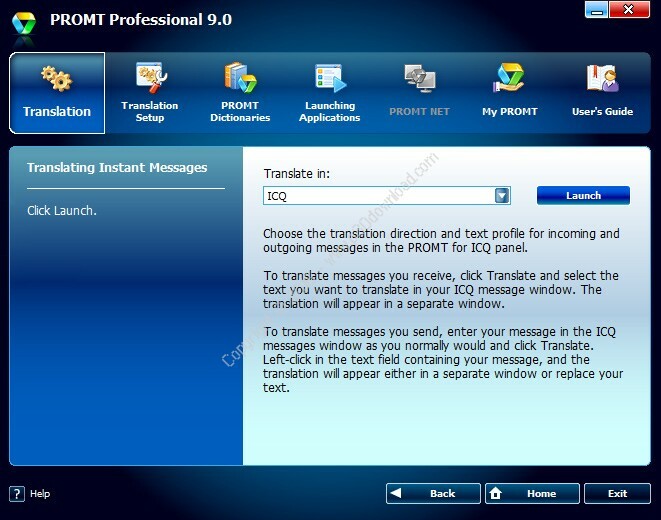 PROMT Professional 9.0 breaks barriers to efficientcommunication thanks to the feature that enables translation ofinstant messages in ICQ, Skype, QIP, and MSN Messenger. Dependingon your settings, you can translate messages in a separate windowor directly in your current chat window. This feature is nowavailable in the four most popular instant messengers. In additionto ICQ in v8.5, in v9.0 we have included support for Skype, QIP,and MSN Messenger. Quick translation of analytical articles by international experts,news from all over the world, and quick familiarization withinformation from foreign-language sources—these are just a fewtasks that PROMT Professional 9.0 can handle, with translationoptions that can be built into the most popular browsers: InternetExplorer and Mozilla Firefox. You only need to select thetranslation direction and profile, as well as what you want totranslate—the selected portion of a Web page or a Web page in itsentirety. The original text formating will be preserved in thetranslation along with all the URLs on the page. To guarantee maximum accuracy in translating terminology in highlyspecialized and technical texts, it is best to use additionaldictionaries. With PROMT Professional 9.0 you can create your owndictionaries to use with our system. A user can choose one of thetwo modes for editing dictionaries: Simple (with the dictionarydisplayed as a table, where you can add a new term and itstranslation), and Advanced (intended for users with a moresophisticated linguistic background), which offers a number ofadditional features. You can use additional translations of a word or phrase by enablingonline word databases (such as Multitran, for example). You canimmediately add translations from these databases to your userdictionary and use them at any time.